This podcast came highly recommended, which is a wee bit puzzling! Film Sack is a weekly podcast, it’s been around since late 2009, with most episodes clocking in at a little over an hour. The hosts are four guys- Scott Johnson, Brian Ibbot, Brian Dunaway, and Randy Jordan. The format of the show is that every episode they pick a movie off of Netflix streaming and discuss it. They do a general discussion of the film and then break it down into categories such as tropes and awards. There’s no rhyme or reason behind the movies they pick, if it’s a movie and it’s streaming on Netflix then they will watch it for the podcast. Film Sack is the type of podcast that I should really like. It’s a bunch of dudes sitting around talking about a decent variety of films. The show tries to bring humor into the mix, and it has really good audio quality. Yet I really didn’t like Film Sack, and it’s not that it was bad but it’s that I found my time with the podcast completely forgettable. Don’t get me wrong, I understand that by their very nature podcasts are disposable entertainment. That doesn’t mean I should forget about them, the podcasts that are worth listening to stick with the viewer. In that way the world of podcasting is no different than the world of television, the great podcasts make you want to come back week after week. I never wanted to come back to Film Sack, the show never gave me any reason to want to come back. For a show that so wants to be funny it’s actually incredibly drab and rote. The hosts don’t promise deep film criticism, but they have built the show around the idea of lively film discussion that is fun. I found the show hard to engage with, as I drove to work listening to Film Sack with a stony expression on my face it became crystal clear to me that there was no fun to be had with this podcast. As I said above the hosts of Film Sack never try to present themselves as actual critics. That being said their actual criticism did rub me the wrong way at times. One particular instance was in their discussion of The Thing. After basically lauding the film with praise one of the hosts declared that The Thing wasn’t a great “movie,” it was just a good horror movie. He cited The Exorcist as an example of a truly great film because it had drama in it, and the rest of the hosts absentmindedly agreed with him. Opinions are opinions and everyone is entitled to theirs, but I don’t have any desire to listen to some of the closed off opinions put forth by the crew of Film Sack. There are thousands of active film related podcasts to be found through whichever medium you choose. At the end of the day I only want to listen to the podcasts that make me want to come back. 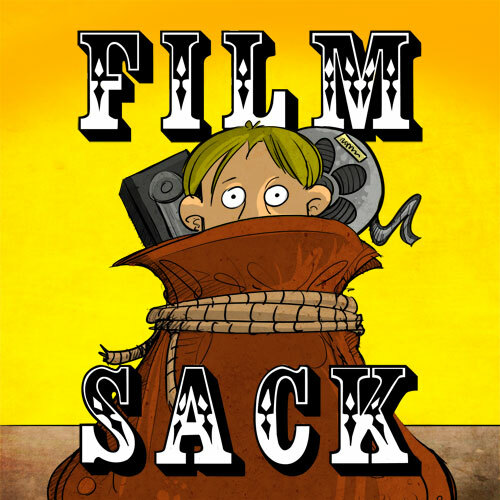 Film Sack is not such a podcast, it’s an unfunny limited discussion of film that failed to grab my interest. My readers would do best to keep Film Sack as an unsubscribe, it’s not one of the thousands of film related podcasts that deserves a slot in your media player. I listen to Film Sack pretty regularly, but I admit it does frustrate me. I categorize it as a podcast about film by four guys who know nothing about film. The primary host, Scott Johnson, waffles…changing his opinion as the others say what they liked and didn’t like about the films. Brian Ibbot (who hosts the far superior Coverville podcast, check it out, it’s worth it) speaks with a great deal of intelligence, however. To be honest, the hosts blended together so much that it was hard to decipher one from the other. I’m glad you get something out of the podcast though, that’s always a good thing. Sorry to hear this one didn’t win you over, but I understand your reasons (and have even felt the same way at times). I’m glad you gave it a shot though. I actually listened to half a dozen episodes and then stopped… but then a couple months later I gave it another shot and I haven’t stopped listening since. I think the second time around I knew what to expect and could hit it up only when I was in the mood. I’m glad you get that much enjoyment out of the show Noff, it’s certainly not something I want to take away from you. I’m not sure if going back to the show would change how I feel, but who knows maybe in the future I’ll give it another shot.